The city of Chicago and the Wrigley Field Rooftops have come to an agreement and the Rooftop companies are now selling tickets for the Winter Classic. The January 1st matchup, between the Detroit Red Wings and the Chicago Blackhawks has been a hot ticket for months. If you're interested in watching the game from a Wrigley Rooftop, check out the Wrigley Field Rooftop Directory, pick your rooftop, give them a call, and make sure to mention The Cubdom. Rooftop clubs with a bird's-eye view of Wrigley Field got the go-ahead Wednesday to cash in on the NHL's New Year's Day Winter Classic. At the request of local Ald. Tom Tunney (44th), the City Council agreed to let rooftop owners, whose operations are normally confined to baseball season, sell tickets to the outdoor game between the Black Hawks and the Detroit Red Wings. "They're a pretty competitive seat," Tunney said, noting that center ice is near second base. "There are a couple of Jumbo-trons. There might be one or two obstructed rooftops," but most of them will have good seats, the alderman said. The Cubdom has an advertising relationship with Wrigley Done Right. It's a great rooftop, and I encourage you to give them a call. Make sure to mention that The Cubdom sent you! Ryne Sandberg will coach the AA Tennessee Smokies in 2009. After two successful seasons as the Peoria Chiefs A-Ball manager, Sandberg's desire to move closer to the bigs was granted by the Cubs organization. 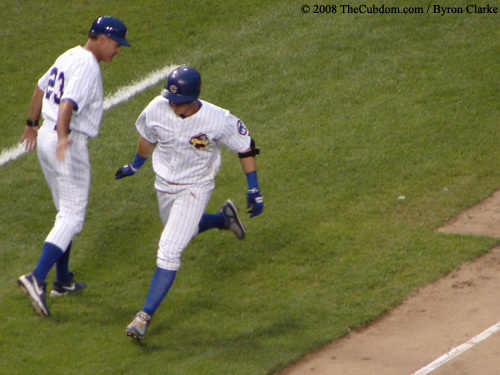 Sandberg had asked for the promotion following the 2007 season, but was asked to stay in Peoria for one more year. Ryne Sandberg congratulates Brandon Guyer after the left fielder's home run in the second inning against the Kane County Cougars at Wrigley Field. From Ed Sherman's Business of Sports blog at Crains, here's an artists rendition of what Wrigley Field will look like for the New Years Winter Classic game at Wrigley. The rink is going to be situated from first to third, and there will be lines showing the exact location of the baseball diamond. The on-deck circles will have the Hawks and Red Wings logos. There is a second, smaller ice surface in the outfield for youth teams. There aren't any boards, creating the feeling that it really is pond hockey. A year ago, when Sam Zell announced the Cubs would be sold, a veritable pool of piranhas lined up to devour the team. But, after a tumultuous second half of the year, the economic environment looks bleak for investors who planned to use debt in their pursuit of the Chicago National League Ball Club. With banks and credit markets largely closed for business, Crain's Chicago Business is reporting that most likely only three groups submitted bids for the 'final' round of bidding on the team, and the names are not terribly familiar to those following the process for some time. The most recognizable name is that of the Ricketts family, founders of TD Ameritrade, who have been considered black horse candidates since the beginning. Hersch Klaff (a real estate mogul) and Marc Utay (a private equity investor) are the others rumored to have submitted bids. It does not appear that Mark Cuban, Don Levin, or John Canning Jr. bid on the team. Crain's: Cubs' Bidders cut to three.